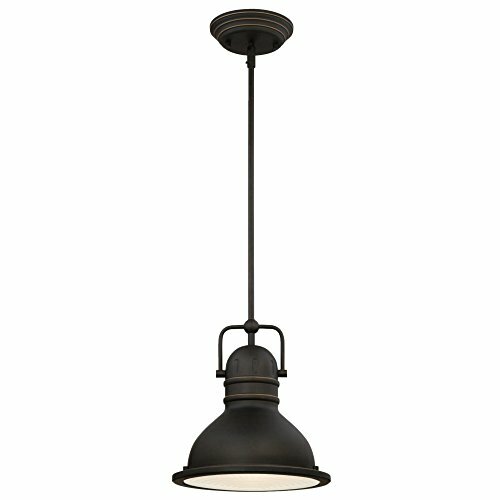 The vintage-industrial style Boswell One-Light LED Pendant makes a statement in any setting. The oil rubbed bronze finish is hand-rubbed to highlight its unique design features and the prismatic frosted acrylic lens adds to the historical aesthetic. Perfect above a kitchen island in pairs, use for additional ambience or task lighting in a bathroom, bedroom or dining room. This Westinghouse indoor mini pendant includes a long-lasting, energy-efficient dimmable LED bulb, eliminating the need for frequent bulb changes, while saving you money. Westinghouse is a trusted, global brand. Westinghouse knows lighting and offers products with exceptional quality, reliability and functionality. Product reference number 63087A.